Whether for operational market research or strategic planning, the economic and statistical information supplied by VDW equips our members with exclusive knowledge and indispensable decision-making tools. The core of our services consists of representative and detailed up-to-date association statistics made available exclusively to our member companies. The main focus is on monthly and quarterly incoming order statistics as an up-to-date indicator, differentiated according to technologies and markets. 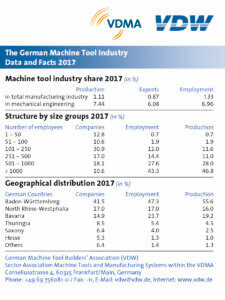 Further data relate to production abroad and the customer structure of German machine tool manufacturers. In addition, we produce data on all key parameters for the industry, such as production, foreign trade, employees, and business climate, primarily based on official statistics. We also report in detail on the place of the industry in the international context. We issue national statistics on machine tool production, foreign trade, consumption, and incoming orders for our members throughout the world, broken down for specific technologies. 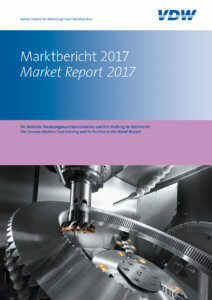 In cooperation with our forecasting partner Oxford Economics, we regularly produce short- and medium-term prognoses for the German machine tool industry, and for developments on the global and key national markets, as a support tool for planning activities. Via our own involvement in the VDMA’s Chinese liaison office, we offer our companies a vast network and specific support for dealing with the world’s biggest market. Knowledge of the key customer industries is indispensable for assessing the market. Our information focuses primarily on the automobile sector with its supplier industries and the machine construction sector as the chief customer groups, as well as on medical engineering. Important strategic developments in relation to markets, technologies, and customer segments are analysed in specific surveys involving external specialist expertise. For interested members of the public, we also regularly provide updated key figures relating to the industry as well as an annual in-depth market report. 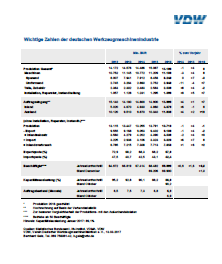 The following quarterly up-dated statistics show the most important data of the German machine tool industry. Conveniently sized booklet with the most important data and facts of the machine tool branch for 2016. “Data + Facts” is published annually in May for the data of the previous year. In a detailed yearly report we describe the situation, prospects, and international position of the sector. The report combines interpretations with elucidating tables and diagrams based on the previous year’s data.